April 13, 2016 April 12, 2016 Dan O. Sometimes, when you’re getting a buzz, you just want to be left alone in peace. Nearly two years later and guess what? The South side Chicago barbershop is still up and running, mostly due and thanks to Calvin Palmer Jr. (Ice Cube), who decided that it was up to him to keep the legacy alive and running. And along for the continous ride with him are his lovely, loyal and entertaining employees – Isaac (Troy Garity), Terri (Eve), Ricky (Michael Ealy), Dinka (Leonard Earl Howze) and the newly-employed Kenard (Kenan Thompson) who may or may not have any clue on how to cut hair. Each and everyone of them have their own personal and workplace problems, and now, it’s only going to get worse, what with a new barbershop called Nappy Cutz moving in across the street. As Calvin tries to change the character of his business, Nappy Cutz, as well as gentrification become a threat to the surrounding community. However, Calvin also knows that it’s up to him, as well as those that love and support him to keep the spirit alive and well of the barbershop and not to let a little business-rivalry get in the way of a good thing. Yup. Those paw prints will get a man for sure. Like I’ve said before, Barbershop was in no way, shape, or form, a solid, comedic masterpiece. If anything, it was just a fine and funny piece of comedy that didn’t ask for too much, and didn’t expect much in return; it just wanted to make the audience laugh, have a good time, and hey, if they learned a thing or two at the end of the day, then guess? All is well and right with the world. And that’s one of the main problems with Barbershop 2 – it sort of loses that same heart and edge that made the first so lovely in the first place. As is the case with most sequels, there’s a lot more of everything that made the first movie such a joy to watch. That means, more characters, more subplots, more messages, more time spent, and most importantly, more jokes, no matter how hard they fall, or how much they may miss. Sequels in and of themselves have a bad rap, but comedy-sequels usually tend to be even more hated as they overdo almost everything and just become grating. While I wouldn’t necessarily call Barbershop 2 “grating”, I wouldn’t call it the greatest 100 minutes I ever spent. Most of this comes down to the fact that the movie isn’t really that funny, or better yet, nearly as funny as the first. A few jokes here and there, make their mark and bring out a chuckle, but plenty of them also come around, miss their mark and don’t really bring out much of any emotion. They’re just dull and plain jokes, for the sake of being told to remind people that this movie is, yes, a comedy. And because of that, there’s maybe only at least 20 minutes where the movie’s actually funny. There’s one key sequence in which Robert Wisdom’s mayoral elect character comes into the barbershop for shameless advertising and propaganda purposes and it’s the funniest scene of the whole movie. I won’t spoil it here, but it constantly builds and builds and builds to an extreme where it’s almost too crazy to not laugh at, and it’s what every comedy should be like. A situation gets placed, the characters are set, and then, we watch it all play out in front of our eyes, waiting for the laughs to start hitting. Eventually, they do, however, they don’t always last. It’s a shame, too, because everyone here seems to be back, ready, and excited to have an even better time with the material here. Cube does his best to remain our eyes and ears of the story, which is fine, because he does it well; Eve is sassy and smart, as expected; Michael Ealy and Troy Garity’s characters still don’t get along and always seem to battle it out over something we don’t really care about; Kenan Thompson brings an added-level of zany fun that’s nice to see; Queen Latifah shows up, essentially, just to plug and prep us all for Beauty Shop, but is such a charming presence that it almost doesn’t matter; and yeah, there’s plenty more to choose from. However, the one who gets the real time and dedication of Barbershop 2 is Cedric the Entertainer’s Eddie and with good reason. Not only was Eddie the best, most funniest part of the first movie, but Cedric himself is just so damn exciting and funny to watch, that it’s hard not to get wrapped-up in almost everything he has to do or say, even if it seems like he’s doing a whole bit of improv. Either way, Eddie gets more of a backstory that has to deal with the history of the barbershop and it’s a bit dull. Mostly, this is due to the fact that a lot of what we see is just flashbacks that, yes, build this character and this barbershop a bit more, but really, doesn’t do much but take time away from the other characters here, as well as add-on more minutes to an already rather long movie. Of course, Cedric is funny. Nobody’s denying that, but all of the backstory with his character seemed to go on for so long that, after awhile, I felt as if they were prepping us all up for Eddie’s own movie. Surprised it never happened, but I can’t say that I’m too upset about it, either. 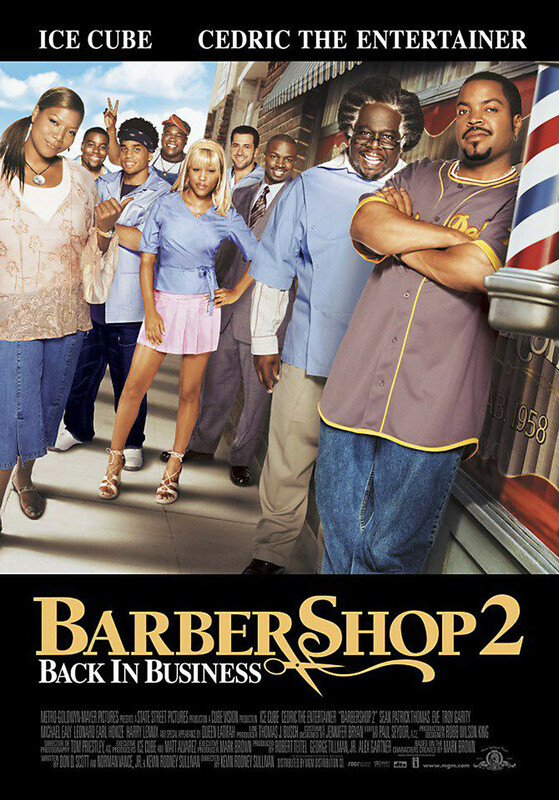 Consensus: Like the original, Barbershop 2 features a bunch of charismatic performers in nice roles, but doesn’t know how to use them as well, with so much going on, and nothing actually being all that funny. Ice Cube just don’t care anymore. He’s cut way too much hair by now. Gotta love HBO Now! Thanks for the mention Dan. I generally agree with you, though I think I laughed as much as I did from the first. But those “everyone doesn’t get along” subplots and Eddie’s flashbacks sucked. Hope The Next Cut surprises but not counting on it.